In this regard it is interesting to compare the approach of Alberta with Norway. While the timing of their respective production rates varies, both jurisdictions have produced about the same volume of oil over the past four decades. In British Columbia, nothing has been set aside from the extraction of natural resources worth hundreds of billions of dollars. All the province has is Christy Clark’s now empty promise of a $100 billion “Prosperity Fund” from natural gas extraction. When oil was discovered in the Norwegian continental shelf in 1969, Norway was very aware of the finite nature of petroleum, and didn’t waste any time legislating policies to manage the new-found resource in a way that would give Norwegians long-term wealth, benefit their entire society and make them competitive beyond just a commodities exporter. This is in contrast to Canada’s free-market approach, he contends, where our government is discouraged from long-term public planning, in favour of allowing the market to determine the pace and scope of development. ‘I would argue quite strongly that the Norwegians have done a much better job of managing their [petroleum] resource,’ Prof. Calvert says. 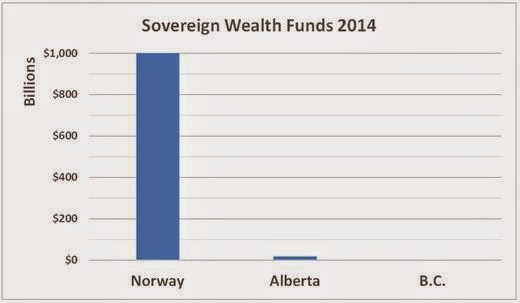 If the people governing Norway shared the philosophies of Canada's right wing parties, the oil industry would be $1 trillion richer. Had policies siimilar to those of Norway been followed in this country, Canadians would be $1 trillion richer. it might be genetic, its hard to say, but we in North America look like a bunch of “dumb fxxks compared to many European Nations. Perhaps the people who stayed in Europe took the long term approach, while those who immigrated over time to North American were in a rush. When people started seriously settling North American it seemed endless, like there was no tomorrow. Perhaps that is the difference. One type of personality stayed in Europe. Another personality type came to North America. Now don't get me wrong, I'm not exempting other groups from this but its just most political leaders in North America are of European descent. Norway is a much smaller country. With their oil they got lucky and were smart enough to think about the future. North Americans are still under the illusion it will go on forever because we have always had such good fortune and resources. How does one fix “Stupid” ?? Canada is a nation of 'hicks' run by con-men and con-women. Our so called democracy is now based on the old soviet model, a showcase election every four years and if one is not happy with that they are labelled a dissident or worse, a terrorist. We have the best politicians money can buy and our 5th estate, the mainstream media are eunuchs, all with their 'balls' cut off. The Oligarchs run Canada, mostly funded by illegal drug monies (so easily laundered in BC). Our politicians are in their pocket and in most cases, the right politician will win because enough money will be invested to ensure he wins. The elites in the province glad hand this as their wealth is protected and in most cases subsidized by the lower classes, with onerous taxes and user fees. Change will not happen because the Oligarchs do not want change and will pervert the laws to eventually eradicate dissent. The sad fact is, Canada will eventually implode with debt and mismanagement and from the ashes will arise something we just do not know. Norm. didn't John Calvert write a book critical of the IPP's or Pirate Power a few years back? BC Liberals motto-IN DEBT WE TRUST.? Yes, “Liquid Gold” was published in 2007. Instead of gifting this resource to foreigners, complete with subsidies, would it not better serve our local manufacturers, the transportation industry (read: ferries, railroad locomotives, heavy equipment, transport trucks, and even the residential community.) No exorbitant liquification costs, no shipping costs, no danger to our shore line and a chance for local employment, income taxes and a competitive economy. Heck fire, if we're going to give it away, at least give it to someone you know! Yes, but there is a marked deficit of common sense amongst those that work in the legislature in Victoria. That coupled with the dishonest politicians and we have what is now a joke and a giveaway to big business. BCgives water away royalty free and exports raw logs.What made you think cng/ LNG/ fracking would be any different.? Royalty low enough as excuse for site C dam.? Gas 25 pennies for a liter. Made in BC.? Iranians with cars currently pay 4000 rials (33 cents) a litre for a monthly allowance of 60 litres and 7000 rials a litre for larger volumes.